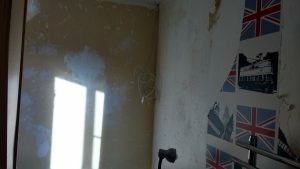 Last week after parkrun and breakfast at my parents, I came home to carry on with the wallpaper steaming. I feel like we’ve been doing it forever, but actually I think this was only our second weekend of it. The week before we managed two bedroom walls before having to get ready to go out, but this week we had no plans for Saturday so could take our time. I am not sure if this was a good thing or not! We finished the other two bedrooms walls relatively quickly and then had a quick break for a drink and some toast (the steamer had to be left to cool down for a bit before we could use it again). Then we started on my office. The wallpaper just would not come off easily- argh! In the end we had to peel the top part of the paper off by hand, and then steam the stuff that was left over, and scrape it off. 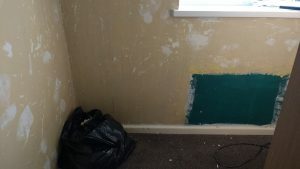 The walls underneath look like such a mess- all those white bits look like wallpaper but they are random bits of paint or poly filler, They obviously got rid of a radiator (there is now a heated towel rail on the opposite wall) and this dark green paint is in quite a few places still. 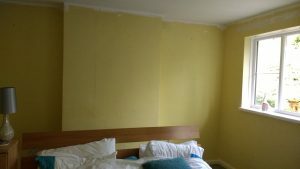 We were hoping to be able to paint the walls, but I think we are going to have to use lining paper as the walls as not at all smooth. Anyway, this was just not enjoyable. It was a boiling hot day, we had the one window open but of course we were making steam the while time. We were both pouring with sweat, and once we had started we didn’t want to stop so powered through until around 7pm. We had only a small bit left (behind the towel rail- which we finished off yesterday) – we could not face taking the rail away, plus the steamer needed to cool again so we would have been doing it at 8.30pm- a bit too late!. 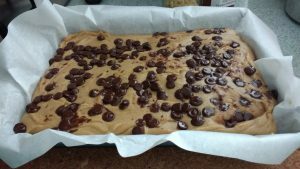 As it was coming up to the last week at school, I made some peanut butter fudge as end of term gifts for the people that I work with. 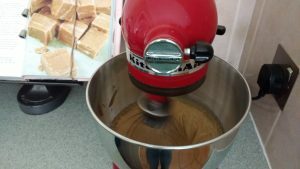 I used to use an electric hand-whisk over the saucepan, but now I leave it in the mixer (once it’s got to the right temperature in the pan) and it is so much easier- just leave it to swirl away before pouring it into the tray to set. I had some chocolate chips in the cupboard so I sprinkled these on- as the fudge was warm they melted a bit and made the top go all swirly- very pretty. 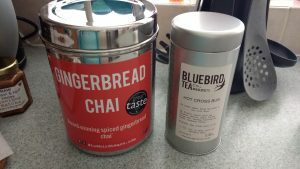 One of my work friends is leaving, and she shares a similar passion for tea- I have given her some of the Bluebird Christmas tea before, which she loved, so I decided to order some summery ones for her (strawberry lemonade is just amazing as an iced tea) and alongside it I thought I would get myself a tin of the gingerbread chai. When it arrived it turned out I had ordered one of the massive tins! I thought it would be like the one on the right. I suppose it did contain something like 40 teabags so I should have guessed! This shows my end of term tiredness and why you should not internet shop late at night! At least we have cupboard space for it now anyway! 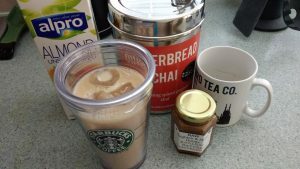 I have been perfecting my own iced chai latte using those gingerbread tea bags- one steeped in hot water with a bit of honey (I bought their rooibos matcha honey to get free delivery- so basically free honey, right? 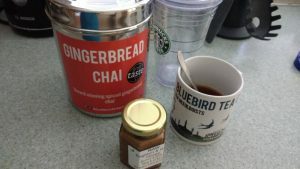 ), then added to a glass of ice and milk. 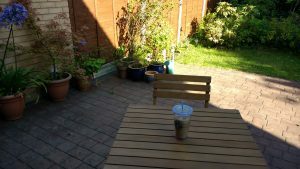 And I even get to enjoy it in the garden- it doesn’t get much better than that. On Sunday morning I was up early as I was meeting friends for breakfast later. I have made a rough plan for the miles to make 100 miles in July, and I thought I needed to do 10 on Sunday. I knew I had to leave my 11.15, and in the end I cut it slightly short to run 9 miles, as I wanted to have time to wash my hair. When I actually looked at my plan, it turned out I only needed to do 8 miles. Whoops! 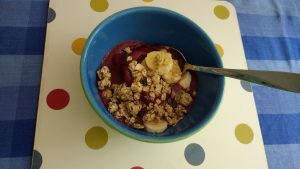 I was very hot and hungry when I got home, so Andy made us a lovely acai bowl each which helped to cool me down (breakfast number 1!). I wasn’t meeting my friends until 11.45 (and in fact I was a little late as I forgot to factor in that I now live further away- duh) so although we ordered breakfast (my second of the day), it was actually lunch time, so I think it’s OK? We had a lovely time catching up over tea and croissants, while someone played a piano in the corner- very civilised indeed. Have you had any online ordering mistakes? One of my friends ordered a table, thinking it would be dining room sized and it ended up being more like a side table. Which meal would you double up on if you could? Next Next post: Holiday baking!